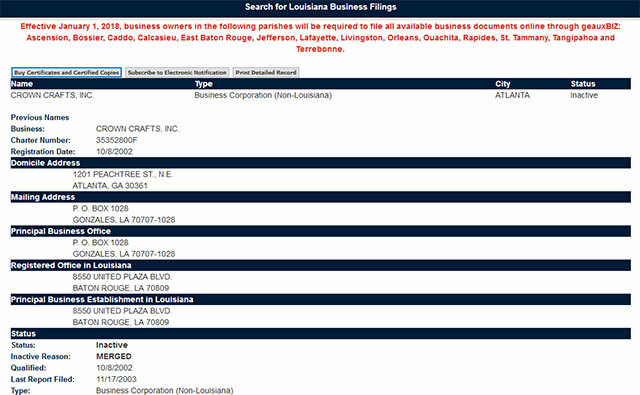 The business corporation registry of the Louisiana Secretary of State falls under the Commercial Division. The Division is responsible for the registration of business entities in the state and administration of trademark laws. 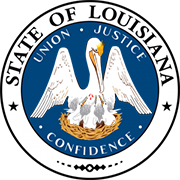 The online search tool of the Louisiana Secretary of State allows the user to search the database for any kind of business entity that has been registered in the state. Follow the step by step guidelines below on how to use the Louisiana business search page. 1. The first step is to access the Louisiana business search page by clicking here. (this will look similar to the screenshot below). 2. The next step is to fill out the appropriate fields. For this example go ahead and type in the Business Entity name "Crown Crafts" in the "Name" field. 3. Now click on the "Search" button. The Results Page will then appear. 4. Now click on the "Details" button. The page that follows will give you further information regarding the entity you are searching for. Details on Charter Number, Registration Date, Domicile Address, etc. will be displayed (see the screenshot below for reference). The Secretary of State of Louisiana is one of the constitutionally-created elected government officials in the state. The current officeholder of the Louisiana Secretary of State is Tom Schedler, a Republican who assumed office in November 2010. The Louisiana Secretary of State is the official in charge of the following eight divisions of the state.